Lenovo (SEHK:0992) (Pink Sheets:LNVGY) today released an all-new version of AirClass, the comprehensive virtual training platform that helps corporate trainers harness the flexibility and breadth of options that virtual training offers. 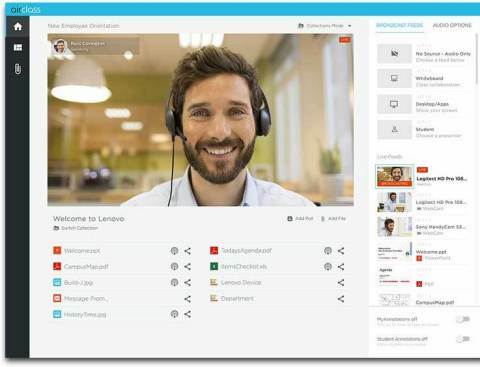 By introducing industry-first features such as Engagement Score and Emotion Insight, Lenovo AirClass equips instructors with advanced analytical tools that can assess employee participation and drive a better virtual training experience. As an instructor , Engagement Score will let you see beyond the screen and adapt the lesson by determining true engagement among each participant, and the class as a whole. It combines multiple indicators—such as watching a presentation, participating in chat, contributing to a whiteboard, answering a poll question and more— to reach a total engagement score that's continuously updated as the live virtual training progresses. Emotion Insights uses advanced facial recognition technology to map 68 points on the face and record emotions like confusion and happiness. Aggregated, anonymous results are displayed, along with recorded replays so you can see exactly when participants are engaged, excited or distracted and uninterested. Whiteboards and annotations allow entire online classes to contribute to a single whiteboard simultaneously and see what others are adding in real time. Annotated video comments further support collaborative conversations versus one-way screen-shares. Breakout Rooms enable instructors to facilitate deeper discussions in small group settings, where anyone can be a presenter and lead the discussion. Participants are broken out into small groups based on their live Engagement Scores to ensure each room has sufficient levels of activity. Replay allows instructors and participants to "relive" the training just as if they were attending the live event. Instructors see collective Engagement Scores and Emotion Insights as the Replay progresses, while students can follow chats and shared documents in the same order they were shared the first time around. According to Training Magazine 1 , the $70 billion corporate training industry is embracing the digital transformation. Businesses are spending more per learner, yet employees are engaged in 5% fewer face-to-face instruction hours. 73% of companies surveyed used virtual classroom delivery methods. A report from corporate training company Corporate Visions 2 indicates that 65% of companies plan to increase their investments in virtual training. The all-new AirClass will benefit the growing number of companies that are spending more per learner on virtual training. By making it smarter, AirClass will give instructors the tools to create training programs that will have a lasting impact with learners. "We know from research that training and professional development opportunities often impact employees' decisions to stay with a company and that current solutions are not empowering companies to meet these needs," said Rick German, general manager, Lenovo Software. "In the increasingly virtual environment, trainers should not have to compromise what could be done in a traditional classroom because they're forced to cope with limited online solutions. With AirClass, they can deliver course content in a clear, effective manner so attendees absorb—and retain—the most vital concepts for better business outcomes." "Using AirClass has been a different kind of experience—one that takes virtual learning to a new level," said AirClass user Andora J. Gandy, who offers leadership development, sales training and curriculum development at RepeatIT Excellence. "The polling, whiteboard and breakout sessions allow me to create a much more interactive presentation that typically improves student feedback," said Michael Verbic, a senior solutions architect at Carolinas IT. "As an instructor who believes in practice, practice, practice, being able to stage and review the complete presentation ahead of time makes this new version a dream." AirClass is currently available in the United States starting at $69 a month per license. For more information, visit www.airclass.com, contact your sales representative, email sales@lenovosoftware.com, or call 317.284.1173. For more information on Lenovo Software solutions including AirClass, Unified Workspace, and LanSchool, please visit www.LenovoSoftware.com and follow us on Twitter, Facebook, and LinkedIn. Lenovo (SEHK:0992) (Pink Sheets:LNVGY) is a $45 billion global Fortune 500 company and a leader in providing innovative consumer, commercial and enterprise technology. Our portfolio of high-quality, secure products and services covers PCs (including the legendary Think and multimode Yoga brands), workstations, servers, storage, smart TVs and a family of mobile products like smartphones (including the Motorola brand), tablets and apps. Join us on LinkedIn, follow us on Facebook or Twitter ( @Lenovo) or visit us at www.lenovo.com.